A number of families together own a boat as a syndicate. Each owner contributes to the upkeep in proportion to the size of their share of the boat. The most common syndicate size is 12 or 12 plus a half share. Owners usually get at least three weeks holiday on their boat each year. Shared ownership means owning a chunk of boat along with the other syndicate members - it isn't time share. There are also some schemes where a whole boat is owned but is only used for a limited time each year and a hire company hires it out at other times and looks after all the maintenance, etc. The Draw system – the year is divided up into the four seasons. At the syndicate AGM each year, owners draw the weeks at random, according to the number of shares they own, and that decides the week of their holiday in that quarter. Once owners know their weeks, they can then exchange them with other owners. Some syndicates use a rota ladder system which decides the order in which owners draw weeks. If an owner is unable to use any of their selected weeks they may either swap with another owner or offer the unused time for use by another member of your syndicate. As weeks become available under this system you may be able to take up unused weeks from other owners, the only extra costs being the diesel and pump outs. The List system – the shares and their owners are listed in a set sequence which rotates, normally two places each year. For the year in question, the first choice of weeks goes to the owners at the top of the list and then in order down the list. At the end of the year, the two owners at the top of the list drop to the bottom and everyone else moves up. Usually three weeks are selected this way, then owners can ask to use the boat for the remaining free weeks, with the priority from the bottom of the list this time around. Individual syndicates vary in the way these extra weeks are selected. Some syndicates ask owners taking extra weeks to contribute towards the extra routine maintenance that results from an extra week's use. The Flexi system – this system is used by boats originating from Carefree Cruising. There are 'red weeks' in high season and 'yellow weeks' in spring and autumn plus 'blue weeks' in winter. Owners buy a red week shares if they want high season or school holiday time on the boat or yellow week shares - at a lower cost - if they want spring and autumn cruising. Some blue weeks go with each of these. Within each group, a rotating priority list system operates. The Fixed week system – this is probably the simplest of all the systems in that a share in the boat is bought with weeks of the year linked to it. This can be an advantage to some owners as it gives certainty about when their boating holiday will be each year. It is the standard system offered by J D Boat Services. The Ad hoc system – owners consult with each other by email, 'round robin' or in some other way to agree which weeks they will each have. This is used by just a few private, self-managed syndicates. Many syndicates have some 'special status' school holiday shares that allow owners of those shares to choose their weeks first to fit in with school holidays. There are normally no more than two of these 'special' shares in any syndicate, but their are exceptions. Syndicates set an annual premium for these special shares, which is paid into the boat account. Each syndicate decides what this premium should be, but it generally ranges from around £100 up to 25% of all costs. Before buying a special share, therefore, you need to check the syndicate agreement to see what this premium would be. Even If the syndicate doesn't have any special shares, which is more common with the draw system, other owners will usually co-operate by swapping school holiday weeks that they have drawn if they would prefer to go boating out of school holiday times, with those who specifically need them. Many syndicates now have share certificates and the syndicate agreements commonly allow for up to four named family members (21yrs or over) who you will allow to use your boat without you being on board. Most shared ownership boats can sleep up to 6 people, so you can take friends and family cruising with you. Many syndicates insist on having all users named and passing this information on to their insurers. Shares in new boats are currently in the region of £7,000 to £11,000 depending on the boat size and specification. Existing owners who want to sell their shares are currently offering them for figures from around £1,000 up to the price of a new boat share. With an existing share, the price it actually changes hands for is what the buyer is prepared to pay and the owner is willing to accept. Generally this reflects the age, facilities and market value of the boat. You can buy a share through one of the four professional management companies and a composite listing of all the shares they have on offer is included on this site. The list can be searched and then sorted to give you a 'short list' of boats to see. 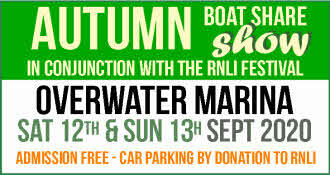 All these companies hold open days and viewings where you can see a number of boats with shares for sale. All four management companies sponsor The Boat Share Show at Braunston, on 12th & 13th April 2004, which is an ideal opportunity to talk to the companies and to existing owners before making your choice. Management companies will normally take care of any paperwork and arrange for you to be shown how everything works when you arrive for your first cruise. Shares are also offered for sale on a number of websites, even on ebay. 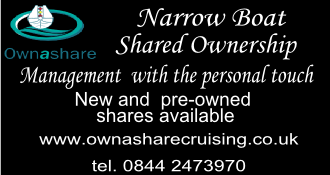 As far as we know, the only site specifically offering shares for sale is boatshare.co.uk (no connection with this site). Some marina-based brokerages also offer shares for sale. Before you part with any money, make sure you have read the syndicate agreement and you know what the boat's running costs are. Although shared ownership is by far the most cost effective way of going boating, the total amount you spend during the period of your ownership on running costs and maintenance is likely to far exceed what you pay to buy the share in the first place. There are no guarantees - the sale price will be affected by the age & condition of the boat and other factors. In general, though, depreciation on boats is relatively low - a share in a 16 year old boat may cost around a quarter of the price of a share in a new boat. The owner selling the share sets the asking price at which they wish to sell. Firstly, check your syndicate agreement. Many syndicates require you to give other owners notice of your intention to sell your share. If your boat is managed by one of the professional boat management companies ( BCBM Boat Share, Carefree Cruising and Ownashare Cruising) you will be able to use their share brokerage services and they will handle everything for you, including advertising the share for sale, representing you at shows, showing prospective buyers over your boat, negotiating the price and finalising the sale. If you use one of these companies, your share will also be included in the searchable listing on this site, which is the most comprehensive list of narrowboat shares in the UK. Managed boats with shares for sale through their own management company may also have the opportunity to get the boat into one of the shows and open days that these companies organise, including The Boat Share Show at Braunston on 13th & 14th April 2014. Experience suggests that attendance at shows is one of the most effective ways of selling a share. Some of the companies restrict their brokerage activities mostly to boats they manage, so your own management company would always be your first port of call when you want to sell your share. If you are trying to sell a share in a self-managed boat, the options may be more limited. If the reason for selling your share is to upgrade to a newer managed boat, then again your best bet is to talk to the company manging the intended new boat. Even if you're not upgrading, it's always worth asking one of the mangement companies if they can help. Some offer brokerage services for self-managed syndicates on an equal footing with those in their managed boats and, of course, using one of the management companies gets your share listed on this site as well. The alternative is essentially a DIY option. If you are doing this, you can use a specialist shared ownership website to advertise your share. As far as we know, the only one in this category is boatshare.co.uk (which is completely separate from boatshare4u.co.uk). Any shares in self-managed boats that are advertised on boatshare.co.uk will also be included in the combined listing on this site, making this the most comprehensive list of available shares to be found anywhere. There are a number of other websites that offer shares for sale alongside other boat sales and there are also 'For sale' sections in some of the forums. Shares have even been offered on ebay. If your boat is moored in a marina with a brokerage based there, then the brokerage may be prepared to offer your share for sale. You should also put a 'Share for sale' sign in the boat windows - and encourage your fellow owners to keep it there when they are on the boat! Unfortunately, it isn't possible to include details of shares offered in such a wide range of places in the combine list of available shares on theis site. With any of these DIY options (particularly the web-only ones) you are likely to have to show round any prospective buyers, sort out any paperwork and then show the buyers everything they need to know about the boat when they go on their first trip. You will also probably need to get your buyer to sign the syndicate agreement before they can get use of the boat. For as long as you choose. With shared ownership, the boat is completely owned by the syndicate members together. Syndicates may use management companies, but the boat still belongs to the individual members of the syndicate. The syndicate exists only to own and enjoy the boat, so it will last as long as the members want to keep their boat. If the boat is regularly maintained to a high standard the life span of the boat is virtually unlimited. Syndicate agreements will normally specify what majority of owners is required to sell the boat - generally 75% or more. There may come a time when the cost of maintaining your boat gets too high. At that point the syndicate may be disbanded, with those owners who want to continue with shared ownership finding shares in other boats. Some management companies also offer a complete boat replacement service for a syndicate - building a new boat to meet the syndicate's requirements and managing it for them as well as selling the old boat for them to contribute to the costs of the new one. How much is having a share going to cost me? Each syndicate member contributes to the annual running costs such as mooring charges, insurance, licence etc. and also to each year’s winter maintenance costs. The figure will depend very much on what the syndicate decides to have done to their boat, but the annual cost is usually in the region of £1,200 to £1,500 per 1/12 share. That's of the same order as a week's hire of a similar sized narrowboat in the summer season, but your 1/12 share will give you 3 or 4 weeks cruising each year. Details of actual expenditure are often given as part of the information when a share is being offered for sale. If they aren't, ask for them! What are the costs of using a management company? Management companies vary, but this is commonly in the region of £400 per share per year. Some companies offer a complete management package with a service level agreement, while others may offer individual management elements which may be helpful in filling particular gaps for self-managed syndicates. This cost is clearly not incurred by self-managed syndicates, but that means that the members of the syndicate must be prepared to take on the various tasks involved in managing their boat - including things like checking on the boat regularly during icy weather to make sure the water system hasn't frozen. Most management companies and syndicates are happy for you to spread the cost of management charges and syndicate contributions into monthly payments. The exception may be winter maintenance costs, and common practice is now for owners to pay half the estimated cost 'up front' with the balance when the work has been completed and 'signed off.' Some management companies allow even this to be spread, while some syndicates pay a little extra into their boat account to build up a winter maintenance fund. Can we see if someone isn’t paying their fair share? Some management companies and syndicates issue monthly accounts to all owners, so that everyone can see the position. Before buying a share, you should be sure that you will be able to get a regular view of the accounts and bank statements. What happens if someone doesn’t pay up? This can be a difficult situation - and is one of the reasons that many syndicates use a management company. As long as the syndicate agreement is clear, it should be possible to prevent anyone who hasn't paid their share from using the boat. As a last resort, the syndicate should be able to reclaim the share, balancing the outstanding costs against the share value, and it should then be able to sell the share to a new owner. Each syndicate member is responsible for the boat when they are using it. Syndicate agreements will normally explain what damage an owner would be expected to pay for and what the syndicate and its insurers should carry. The syndicate member is responsible for refuelling, filling up with water, pumping out and cleaning the boat when their time on board comes to an end, so that the boat is ready for the next owner. The syndicate agreement should explain other obligations. Absolutely not. As far as we know this is not allowed by any syndicate agreement as it would immediately invalidate the insurance and Boat Safety Certificate and it would breach the terms of the licence. Shared ownership boats generally move base every couple of years or so, depending on what cruising routes are available from any base. The decision as to where to moor the boat for the coming year is usually made by the owners at their syndicate AGM. Many syndicates have emailed discussions of the options well in advance of the AGM. Many syndicate agreements now recommend that owners have appropriate training. Owners who have done so, generally find that it improves their confidence and the enjoyment of their boat. If you are an owner reading this and you have experience of a good trainer, please let us know so that we can list him (or her) on this site. If the syndicate uses a management company, it will explain the procedure. Self managed syndicate will need to contact their home base or a nearby yard, or the syndicate may use the services of River and Canal Rescue. The cost of call-outs is normally charged to syndicate funds. Regular maintenance is the best way of reducing the risk of breakdowns when you're cruising. There are several reasons for not buying your own boat, the biggest reason being the initial capital outlay. Then there is the cost of the mooring, licensing, insurance and the maintenance. As the sole owner of a boat you would probably only use it 4 or 5 times a year which is not advisable as boats like to be used, otherwise they deteriorate much faster than if they are run regularly. Shared Ownership is a solution to cater for those who want to go boating every year but are not going to make use of the boat for more than a few weeks each year. This system enables you to buy into a far higher quality boat than you might otherwise be able to afford and then to reduce the running costs compared with sole ownership by dividing all the costs amongst the owners. Why should syndicates have their own ‘Syndicate Agreement’ ? The Syndicate Agreement is like a set of club rules and sets out how the members will work together. It will also include how time on board is allocated, what happens if an owner defaults on payments or can't continue as a member for any reason, other than selling his or her share. It should also deal with things like how to resolve disputes and what majority vote is required for major decisions - such as selling the boat. The Syndicate Agreement defines the rights and responsibilities of owners. If you have any other questions not answered here, or need clarification on any of the points made, please don’t hesitate to email Andrew.